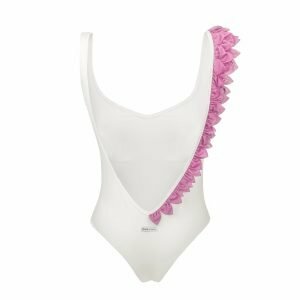 In Bloom is a one piece bikini with handmade 3D tulle petals crafted by our expert tailors to gentle embellish your shoulder. In Bloom is 100% made in Italy, just like all our swimsuits. Blossomy is a one shoulder bikini with handmade 3D tulle petals crafted by our expert tailors to gentle embellish your shoulder. Blossomy is 100% made in Italy, just like all our swimsuits. Vanilla is an elegant silky matte one piece swimsuit with 3D braided shoulder straps. It comes in white and red and is 100% made in Italy. Copyright © 2018. all right reserved Kinda 3D Swimwear.